Hear what Dr. Richard Moy has to say! Since then Dr. Moy has performed more bunion surgery than any other surgeon in the world. What sets Dr. Moy apart? It’s the volume, consistency, and long-term results of painless bunion surgery. How do we know the results are that good, and where is the proof? Listen to all of the patients who have had the procedure. In over 97% of all cases, patients state their surgery was painless. Dr. Moy is the only surgeon in the world who will post all of the before and after photos on every single surgery he performs. Dr. Moy is the only surgeon in the world who will display every patient’s evaluation’s and comments on how the on how painless the bunion surgery was, without exception! How do you know who the best is at anything in the world? Answer, To look at every performance and outcome. For example: Just because someone has been playing golf for 30 years, or performing bunion surgery for 30 years, does not mean they are exceptional at what they do. In this case we fail to evaluate the scores of every tournament they played in or every surgical recovery process and outcome. How do we know that golfers like Jack Nicklaus and Tiger Woods were exceptional golfers in their time? Answer, by evaluating every tournament they played in, and the final scores. Again, Dr. Moy is the only bunion surgeon in the world who will post every before and after photograph as well as every evaluation on every single patient. What does painless bunion surgery really mean? And, how is it different than the average foot surgeon results? Dr. Moy performs a local anesthetic block after the patient is asleep from intravenous sedation. This means the patient will not feel the numbing process of their foot. Once the bunion surgery is over, and the local anesthetic has worn off, there is no pain and therefore no need to take any pain medication what so ever! The average bunion surgery results in a lot of pain. It’s so painful you have to constantly take narcotic pain medication for weeks or even months. Most people stay in bed until the majority of the pain subsides. When they try to stand to go to the bathroom, the pain will increase, causing them to crawl to the toilet. Some men have carried their wives to the bathroom due to the pain. Because these patients cannot stand, most subject themselves to sponge bathing. Dr. Moy’s patients do not experience pain and therefore can walk immediately after bunion surgery. As soon as the numbness wears off, they will also be able to stand to take a shower or sit in the bathtub. Because there is no pain and no need for narcotic pain medication, Dr.Moy’s patients can drive their car the next day. Many people don’t realize you can get a DUI if you have taken prescription narcotic pain medication and get behind the wheel. The ability to walk immediately after bunion surgery without pain should not be underestimated! Doctor Moy’s bunion surgery patients can get dressed, go to work, or go to the store, and get around to do the things that they need and want to do. With the average foot surgeon, there are many people who are not happy with the recovery process they feel like it was torture. They decide never get bunion surgery on the other foot. Doctor Moy’s bunion procedure is designed with stability of the bones in mind. This allows moderate pressure to the surgical site without concern of displacing the bone. There are many surgeons who will place their patient in a below-the-knee cast after having bunion surgery. Their procedure is not stable enough for the patient to bear any weight, and thereforethe patient requires crutches. If crutches are involved, they are usually used for 6 to 8 weeks. The patient then gets fitted for a walking boot. Dr. Moy’s bunion procedure has patients back into comfortable shoes at 4 weeks. At 6 weeks the patients can start to run and try on high heel shoes. Dr. Moy’s bunion procedure requires a small screw. The screw is there to reposition the bone and help prevent the bunion from recurring. Once the bone has essentially welded itself back together, the screw no longer serves a purpose. Dr. Moy created a screw removal procedure that will allow his patients to be back in regular shoes the next day with a Band-Aid over the 3mm incision site. Bunions are painful bone protrusions, commonly caused by wearing shoes that are too tight. They typically form on the inside edge of the big toe at the first metatarsal joint. 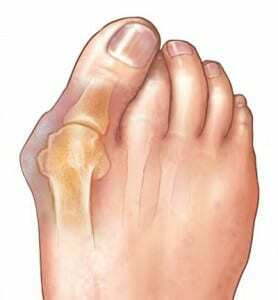 If left untreated, bunions can cause major foot problems. The movement of the big toe can cause the second toe to shift as well, deforming the foot in the process. Red, calloused skin may also be present at the site of the bunion. Fortunately, there are a number of conventional and surgical options available to alleviate the symptoms or completely remove bunions. © 1998-2016 Mayo Foundation for Medical Education and Research. All rights reserved. Bunions develop when the deep toe box is too narrow, effectively pinching the toes. One of the easiest ways to treat bunions is to wear more comfortable shoes. Bunions develop when the deep toe box is too narrow, effectively pinching the toes. If you have a bunion, you should switch to shoes with roomier deep toe boxes, low or flat heels, and adequate arch support. Custom orthotics, such as bunion pads or insoles, can be worn inside the shoes to relieve the pressure on the big toe by distributing your weight better. A trained podiatrist like Dr. Moy can recommend the best orthotic for you. Mole skin or felt patches can be worn over the bunion to prevent it from rubbing on the inside of your shoes. The pain can also be managed using over-the-counter pain relievers and anti-inflammatory medicines like ibuprofen or aspirin. Dr. Moy can let you know which pain reliever is best suited for you. Ice packs can also be used to help reduce swelling. Ice should be kept in a cloth or towel and applied for 10 to 20 minutes at a time. Your foot should be elevated during application. Watch a clearer demonstration of Dr. Richard Moy’s unique procedure with this animation. Watch a real surgery of a Tailor’s Bunion Removal by Expert Dr. Richard Moy using his unique procedure. Watch a Real Surgery with Caption Narrative! Watch a real Bunion Removal surgery by Expert Dr. Richard Moy. Watch how simplistic he makes this complex procedure appear. Kimber, an actual patient of Dr. Moy, takes you every step in the bunion surgery process. Here is a playlist of real patients a few days after surgery. Here from them first hand rate their pain level and satisfaction. How Much Does Bunion Surgery Cost? Most patients have insurance and as in any medical procedure, each insurance pays differently. First, call your insurance company and verify your benefits with our facility to find out your eligibility. Based on the benefits, we will be able to anticipate your out of pocket cost. Because many patients are confused with deductibles, the insurance deductible is a certain amount of money you have to pay first, before your insurance will start applying payment to the surgical charges. The best thing to do is contact the office and talk with our office manager, Penny, about your particular situation, whether you are insured or not. If you’d like to learn more about your insurance, click on link below. Immediately after surgery you will be able to walk with a post-op shoe. You can walk a maximum of 15 minutes per hour, primarily on your heel and or the outside of your foot. You will have a follow-up visit 3-4 days after surgery and will be given a walking boot at that time. At this point you can walk as much as 20 minutes per hour. Return one week after the first post-operative visit to have another dressing change and to remove the sutures. At this point, you can start walking up to 30 minutes per hour in the boot. Increase your walking time by 10 minutes per hour per week. Return approximately two weeks later to get an x-ray of the foot. By the end of the fourth week after surgery, you can resume walking in loose, comfortable fitting shoes. 6 weeks after surgery you will return to have a final x-ray and then return to full physical activity starting slowly and working up to full capacity. This walking boot, or pneumatic boot (also available in black), is given during the first follow-up visit. Unlike casts, walking boots can be removed for bathing and sleeping. It must be worn, however, when the person is up and weight bearing. This step is for patients who are out-of-state and need to go back home. Our office has created a step-by-step video for our patients convenience. This shower boot is used for bathing to make everyday activities easier on our patients. This video is extremely important in the recovery process. Stretching during these stages ensures proper healing and range of motion. Please refer to this video if you need any assistance, or call us at the office. Listen to Why People Travel to See Dr. Moy!